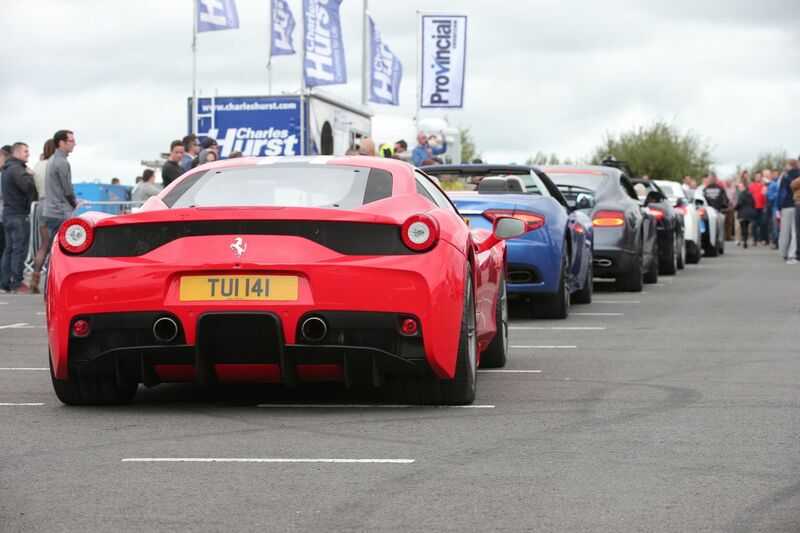 The Hillsborough International Oyster Festival drifted to an end with the closing event, Supercar Sunday, which took place on Sunday 6th September at the Sprucefield Park and Ride. Visitors were treated to a parade of glamourous cars, pictured, as they said farewell to the Festival for another year. Car fanatics had the chance to have a spin in their dream car in exchange for a contribution fee to the Oyster Festival’s named charities, Clubs for Young People (CYP NI) and Hillsborough Village Centre. Supercar owners also had the opportunity to showcase their famous and sought-after automobiles and, by offering the public the chance to ride in their supercar, they helped contribute to the Festival’s 2015 charities. This event was supported by Charles Hurst, TrustFord and The Plough Inn. Thanks to RMS member Warren for the video. That atom impressed me more than anything...thing can seriously shift! I was accelerating foot to floor off the roundabout towards sprucefield and it passed me like I was sitting at a steady speed. Can't see this event being allowed to continue in current format for much longer though....with the amount people standing on the edge of the road or walking up it and the Sunday day trippers tidling around Sprucefield at 20 mph it is only a matter of time before something goes wrong. I think the regular participants would be wise speaking to the organisers of the event and see what can be done for next year because I think everyone feels the same way about it. The big problem with moving it to a track is that I can't see enough of the public taking the time to go to Kirkistown or the like for a quick spin in a car. Where it is works for attracting people but is bad for safety. If it was track based it would end up being a trackday with a few paying punters and would consequently fail. It is a tough one to get right, as suggested before could the maze not be used as a good central spot and have like a drag strip set up and a handling course, then people pay to go a spin from say 0-100+ sprint and then a trip around the handling circuit? just a thought. There would be plenty of parking room at the maze too. I heard people got tickets for parking in B&Q which then drove spectators out to the verges to park up and watch. I was thinking that too Gambit but is that not the only entrance into the retail park or is there another one they could use? im not familiar with the road network around there. You can imagine the businesses kicking up a huge fuss over it saying they could loose business on a sunday. I've been going to this since when it started back in 2005 or whenever. It originally was run out of the square part of hillsborough (got a go in a Dax Tojiero) and it was a novel idea back then. After that, it moved to the school in Hillsborough and quickly outgrew that which then forced it to move along to the park and ride and it's painfully obvious the last few years that it's totally unsuited to hold the even there. If you can't get parked in the P&R itself, you park outside B&Q or Sainsburys and then walk down a dual carriageway with performance cars blasting past you. Then you have the barry boys parked up along the A1 not spending a penny for the event and making a nuisance of themselves. I actually didn't attend this year's event after how much of a pain it was to get round last years. Whilst it would be good to have a closed road or track for this sort of event, you can't realistically do that. It's part of the oyster festival and it can't be moved away. Also, you wouldn't get the same crowds at Nutts corner or worse still, Kirkistown (as @mike150 has said). Closing part or all of the A1 isn't feasible either; people need to get places even on a sunday. While the event is unique and a great fundraising idea, I really think it will be cancelled before there is an accident or fatality. | I was thinking that too Gambit but is that not the only entrance into the retail park or is there another one they could use? im not familiar with the road network around there. You can imagine the businesses kicking up a huge fuss over it saying they could loose business on a sunday. Are they building a new road into the Maze from the Sprucefield Park and Ride? That seems like the logical place for it to move to when the road is finished. Most people are happy for fast straight line runs I'd imagine - to drive otherwise (drifting, cornering hard, etc) in supercars obviously increases the risk stratospherically and nobody's insurance would be that watertight. With that in mind, a closed airfield setup would be best - somewhere with a decent long runway where people can enjoy a fast sprint in a straight line up into the 100s. Is there anywhere like that round Belfast? What about private air clubs like the one in Ards, do they have a runway? It would surely be much easier to set up and safer to have it somewhere like that that on public road on a Sunday.